Michelle Obama is currently on a book tour for her new memoir Becoming, and she is using her wardrobe to separate herself from her First Lady persona. She is wearing outfits and labels that are far away from her Flotus styling — she’s leaning on trouser suits, cult Instagram brands like By Far and trend-led touches, such as ’80s crystal brooches and saddle bags. She is also wearing a lot of white, with highlights including a crisp wide-leg ivory jumpsuit and a white trouser suit. Anne-Marie Curtis, the editor-in-chief of Elle UK, met Obama and said to the Guardian of her use of colour: “She was wearing a cream trouser suit and very high stilettos. She is extremely tall and incredibly toned, so she is seriously imposing. For her portraits in Elle, we wanted images that felt like fashion, but also a true portrait of her. 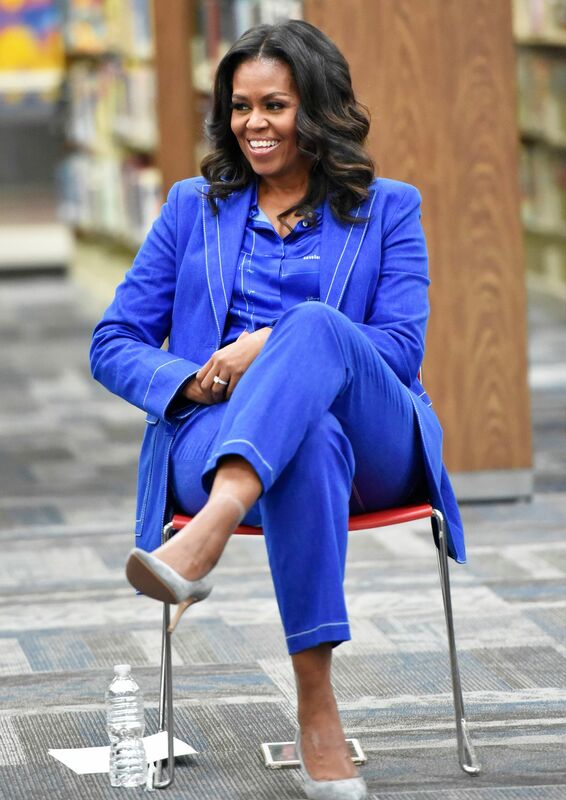 There is a candour to wearing white that connects to the book, and how honest she is.” Keep scrolling to see Michelle Obama’s amazing book tour wardrobe. 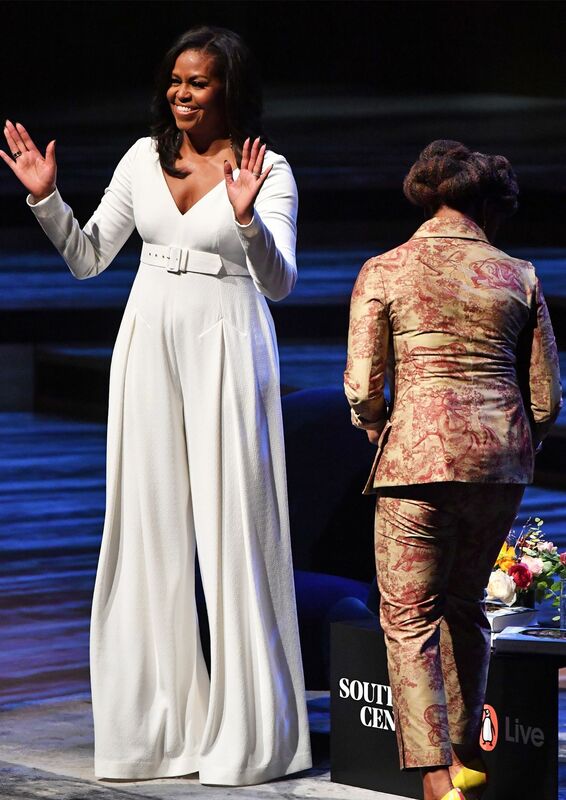 Style Notes: In London at an event at the Southbank Centre, Michelle wore a wide-leg ivory jumpsuit. 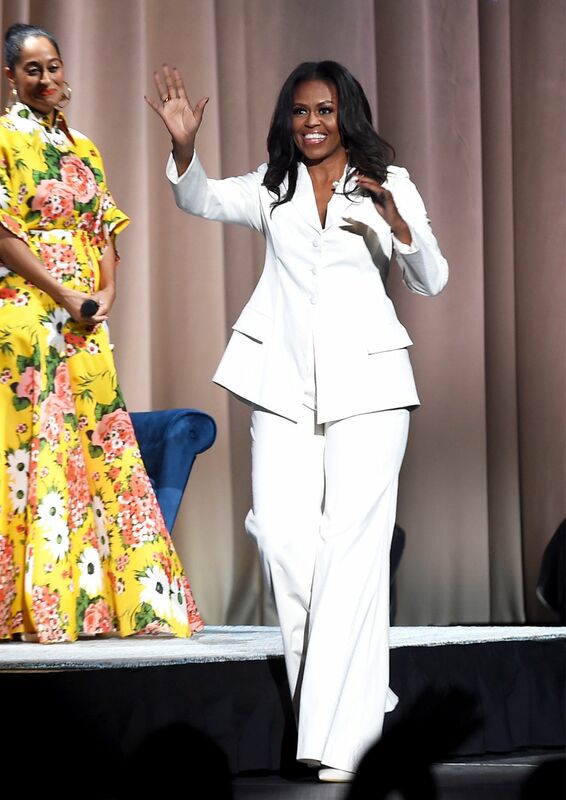 Style Notes: Here is another amazing white outfit from Mobama — she wore an ivory trouser suit for a talk with Tracee Ellis Ross. 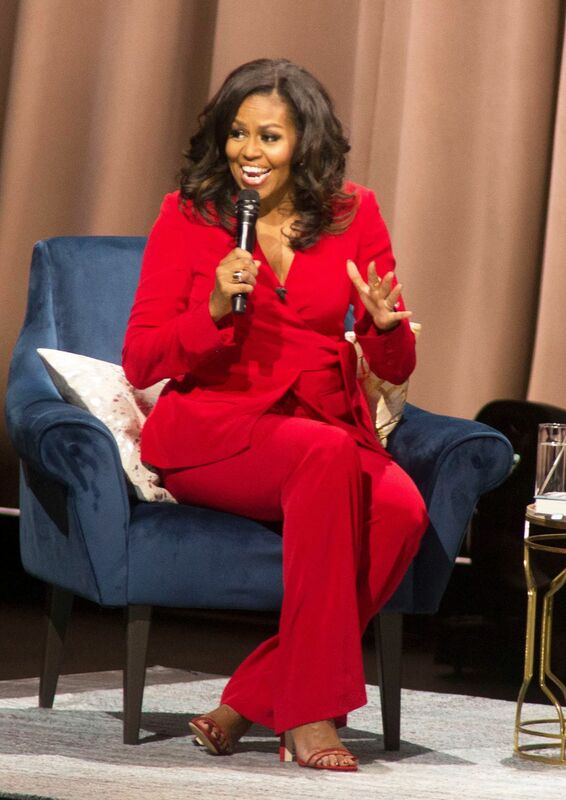 Style Notes: Michelle is wearing lots of power suits, and here she wears a belted pinstripe trouser suit with a tan saddle bag and white heels. 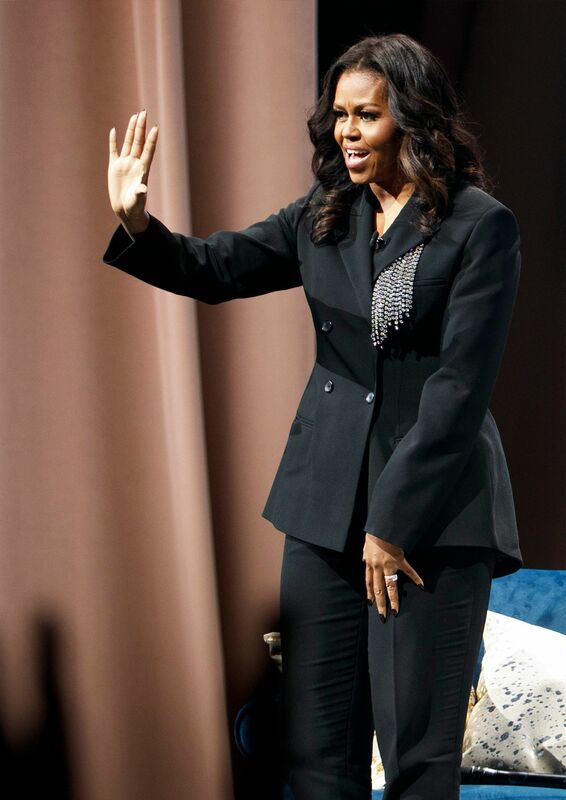 Style Notes: Michelle added a 2018 spin to her black trouser suit, wearing a crystal pin under the lapel. Style Notes: Michelle wore black slim leg trousers and an off-the-shoulder jacket, with a pair of black boots by By Far. 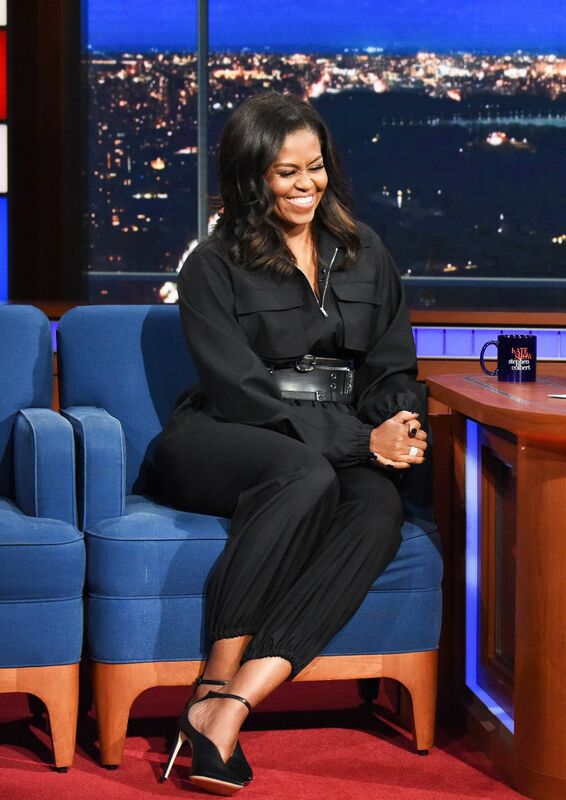 Style Notes: We think Michelle might be bringing back the waist belt, with this all-black outfit. Style Notes: Michelle’s denim trouser suit with a white T-shirt is a relaxed spin on suiting. 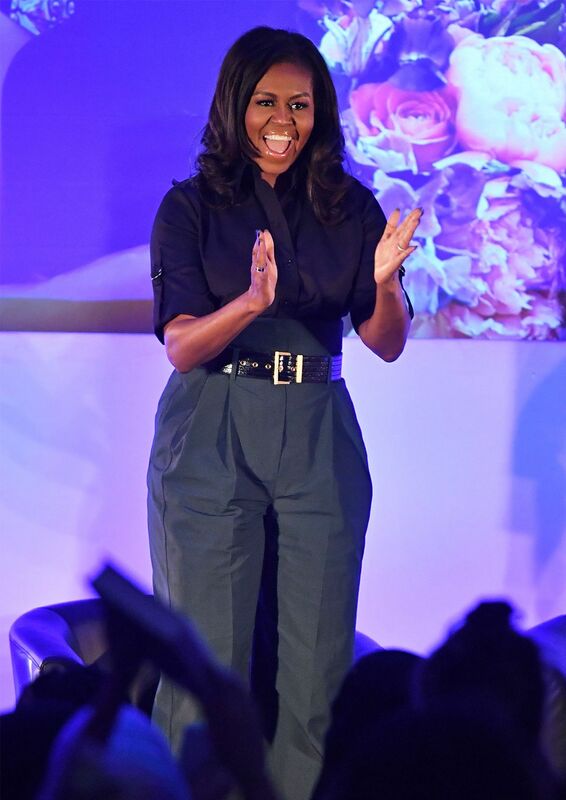 Style Notes: Michelle’s high-waisted charcoal trousers look amazing with her mock croc black leather belt. Style Notes: The wrap silhouette of this jacket is really elegant — and we are into her matching strappy sandals too.